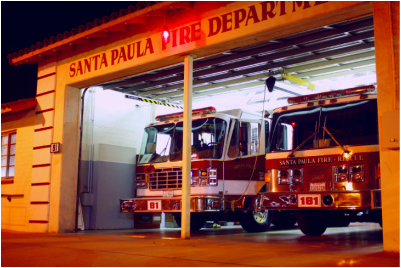 Santa Paula Fire Department covers the 4-square mile City of Santa Paula from 2 stations strategically located in the the city. We maintain 2 primary, on-duty engine companies at all times. Our apparatus also include a "light and air" truck and trailer which responds to incidents at any time county-wide, 2 reserve engines, Chief Officer vehicles, a state of the art mobile command unit and other apparatus to meet the needs of our community.